DIL28 modules RS422/485, TTY e.a. 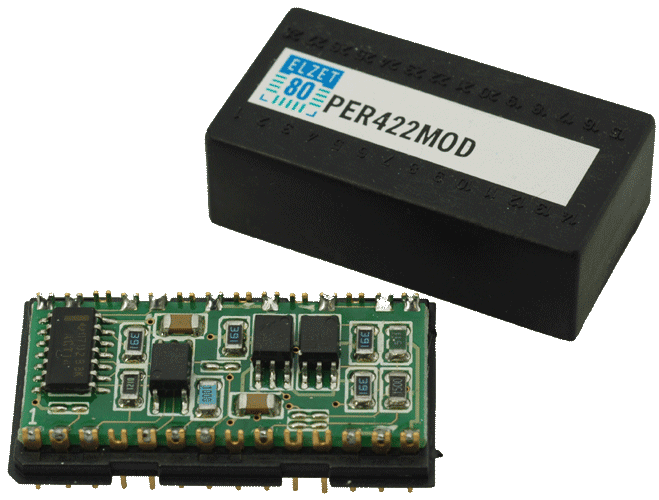 RS232 is a very widely used serial line standard. It is limited, however, to a few meters of cable length and low transmission speed. 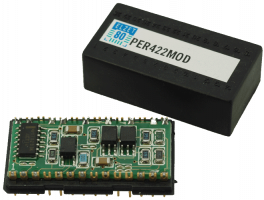 Using level shifter modules instead of fixed RS232 drivers leaves the option to adapt flexibly to the environmental requirements. Fiber optic lines can be used under severe noise conditions and to isolate ELZET 80 computers working in high voltage environments. Connectors are mounted on top of the module. If you require other fiber optic connector types, please consult ELZET80 for availability. ELZET 80's serial line modules use a DIL28 pinout to fit into a standard IC socket. They have 9 output pins to connect to a 9pin-connector. On three pins a code can be retrieved to identify the module type. Modules with signal isolation require an isolated voltage of 5V provided on most of the boards with module socleete.